Tracking the Agg? Why the bond index may not work for investors. The Agg is more than an index. It’s the basis for financial products that represent large fixed-income allocations for many investors. What’s wrong with that? Many investors use products that track the Bloomberg Barclays U.S. Aggregate Bond Index (the Agg) as their core fixed-income allocation. But the Agg has some drawbacks, and investors would be better served by looking beyond the benchmark. As portfolio management techniques advanced in the 1970s, it became increasingly important to measure bond performance. So in 1973, a bond index was created, and after a series of acquisitions culminating in 2016, it became known as the Bloomberg Barclays U.S. Aggregate Bond Index or the Agg. Today, the Agg is composed of over 9,300 bonds worth nearly $20 trillion. The Agg is weighted toward the companies and agencies that have the most debt. In equity markets, investors typically rely on market-capitalization-weighted benchmark indices like the S&P 500 Index — the bigger the company, the bigger its position in the index. Arguably, this approach works because the size of a company can be indicative of its success. But when it comes to fixed income, the same logic doesn’t apply. The largest components of the Agg are the companies and agencies with the most debt outstanding. Having a lot of debt doesn’t necessarily make them a better bond investment; it just means they have a lot of debt. The Agg is heavily weighted toward U.S. government exposure. 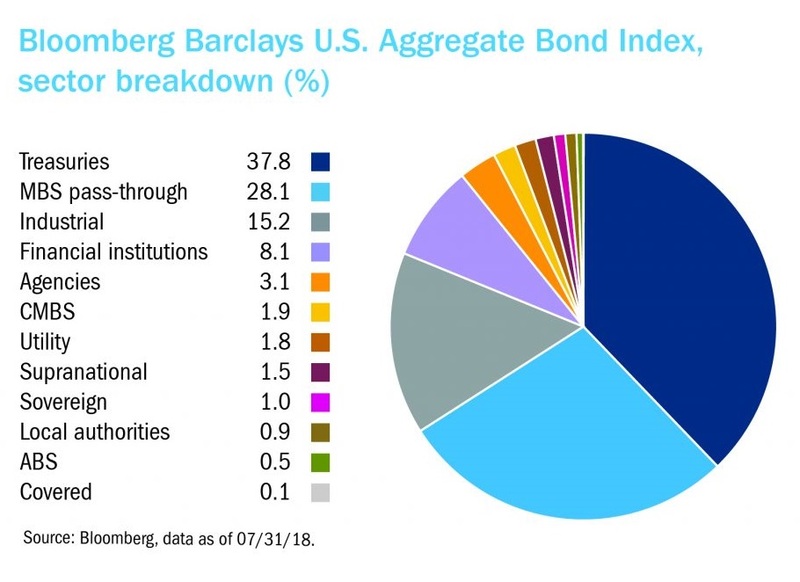 Just because there are thousands of securities in the Agg doesn’t mean that it’s well- diversified across sectors of the bond market. In 2007, the Agg was 22% U.S. Treasuries, but that has increased to 38% today. Factoring in debt issued by government agencies and mortgage-backed securities (MBS), the total government exposure is now over 70%. The largest components of the Agg don’t provide a lot of diversification. The top two components of the Agg — U.S. Treasuries and MBS — have an 82% correlation. That means that historically, returns for those sectors moved in the same direction most of the time. Less-correlated sectors either form a much smaller component of the Agg or — in the case of sectors like U.S. corporate high-yield and emerging market bonds — are not represented in the Agg at all. 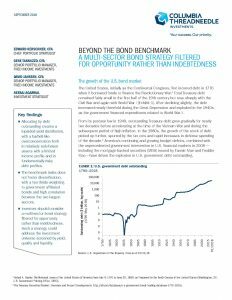 The bond benchmark represents the largest issuers of debt, but not necessarily the best opportunities for fixed-income investors. It also doesn’t foster diversification, with high historical correlations among its largest components. We believe fixed-income investors should look beyond the benchmark. To learn more about the Agg and solutions to its shortcomings, read our white paper. The Bloomberg Barclays U.S. Aggregate Bond Index (the Agg) is a broad-based benchmark that measures the investment grade, U.S. dollar-denominated, fixed-rate taxable bond market. The index includes Treasuries, government-related and corporate securities, MBS (agency fixed-rate and hybrid ARM pass-throughs), ABS and CMBS (agency and non-agency). The Standard & Poor’s (S&P) 500 Index tracks the performance of 500 widely held, large-capitalization U.S. stocks. Past performance is not a guarantee of future results. It is not possible to invest directly in an index.